A young storyteller from Cruden Bay has taken part in the national What’s Your Story? creative showcase. Ailsa Dixon presented pieces that she had worked on with her mentor Lari Don, storyteller and author of the ‘Spellchasers’ series. Teenagers from the What’s Your Story? programme presented their latest work at the Scottish Storytelling Centre in Edinburgh on Monday, October 8. The programme is run by Scottish Book Trust, the national charity transforming lives through reading and writing, and funded by Big Lottery Fund’s Young Start programme, The Badenoch Trust and Kiran’s Trust. Scottish Book Trust partnered with Neu! Reekie! to train the teenagers on presenting their creative works, including illustration, storytelling and poetry. Seven teens were involved in the What’s Your Story? programme, selected from locations across Scotland. They have been partnered with mentors who are experts in their chosen creative field, and the showcase offered the opportunity to display their current work. 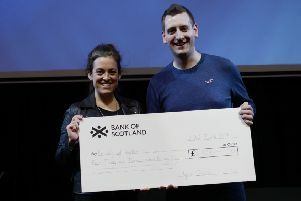 The showcase was a celebration of the work achieved by the young writers, illustrators and storytellers, and was attended by family, friends and invited guests from Scotland’s literary scene. The event also marks the end of the young people’s time on the programme. Ailsa said: “What’s Your Story? has been the best experience of my life to date. Not only do I feel as if I might have a future in Storytelling, but I have a fantastic group of friends in my fellow rookies, and hilarious memories. “Being part of the programme has given me the confidence to know that storytelling is a valid thing for a young person to be doing, and my mentorship with Lari Don has improved my work beyond my wildest dreams. What’s Your Story? was originally funded by Time to Shine, Creative Scotland’s national youth arts strategy and is the first programme of its kind in Scotland.